Extending the life of the space shuttle is all but impossible now because of an inability to manufacture additional external tanks, former space shuttle astronaut Jon McBride said on Wednesday. NASA probably could fly one additional shuttle mission beyond the nine that are on the schedule through next year, said McBride, who is vice president of strategic development for the Kennedy Space Center Visitor Complex/Delaware North Companies Parks & Resorts. â€œA real travestyâ€ is how McBride characterized the decision during a lunchtime address at the Space Investment Summit 6 near Orlando. 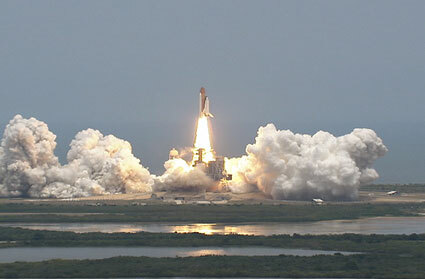 The space shuttle provides the United States with enormous capability for orbital operations. NASA will not fly the small, less capable Orion successor vehicle until at least 2015. McBride noted that decisions made about five years ago to stop shuttle flights to concentrate resources on a successor vehicle are now coming home to roost. He said he didnâ€™t understand why the United States couldnâ€™t afford to operate the space shuttle, build a new human vehicle, and operate ISS at the same time. McBride expressed concern that the United States is losing its edge in space. â€œWe would like to be the first country back on the moon, and we may not be the first country back on the moon,â€ he remarked. Nearly but perhaps not totally irreversible. The decisions that were made five years ago seriously affect for a future US space development capacity. Without a space shuttle many complex and essential tasks will become impossible ones. Given a measure of international support and partnership such investment offers an expedient and practical way to ensure that US space partnership venues are maintained and properly expanded. The entire underlying concept behind space shuttle retirement needs looking at again, as a policy that will leave US without the established resources to enable co-operative space venture going forward is not policy that is conducive to US space development interests. Has anyone noticed that every time something(easily fixable) went wrong with STS, NASA used it as an excuse to reduce the STS capability and mission range/flexibility? Quite unnecessarily I might add. @Kris: Could you be more specific? What “easily fixable” events have occured that led to NASA reducing shuttle mission range/flexibility? I hope you’re not talking about Challenger (not an easily-fixable problem, but also not one that was used as such an excuse as far as I know) or Columbia (the foam-shedding fix is still not perfect). Otherwise I think you have a point. NASA never really developed the shuttle. Development should be ongoing, not a one-time thing. Take the booster rockets for example: NASA could develop liquid flyback boosters than would be much cheaper to operate. And then develop Shuttle-C as a HLLV. Both require relatively high development costs, but nowhere near that of developing a practically new launcher and spacecraft.